Easter Egg In ColdFusion MX Found! I found the easter egg in ColdFusion MX, thanks to a hint given out on the cfguru list by a Macromedia Engineer. "I think I may have made the ColdFusion MX easter egg just a little too hard to find. 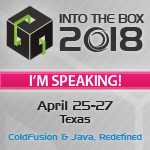 Have you tuned your JVM on ColdFusion MX yet? ColdFusion's move to java gives developers and system administrators a wealth of performance tuning options.